Who Taught You How to Care? Greetings one and all! Can you believe it? The first day of spring is just a few days away. Depending on where you live, you may or may not be enjoying a sneak preview of the upcoming season—warmer temperatures, longer days, and the signs of new life. Regardless, there have been some amazing scenes of spring highlighted on the national news and the Internet recently. Earlier this week, I sat in awe and amazement when viewing the picture of a bald eagle in Pennsylvania, vigilantly sitting on her nest in the midst of a raging snowstorm. What a remarkable image of caregiving! Despite the harsh conditions, the eagle refused to abandon her post. Instinctively, she cared for her eggs. Courageous. Committed. Determined. The image was reminiscent of my mom—the quintessential caregiver in my life. 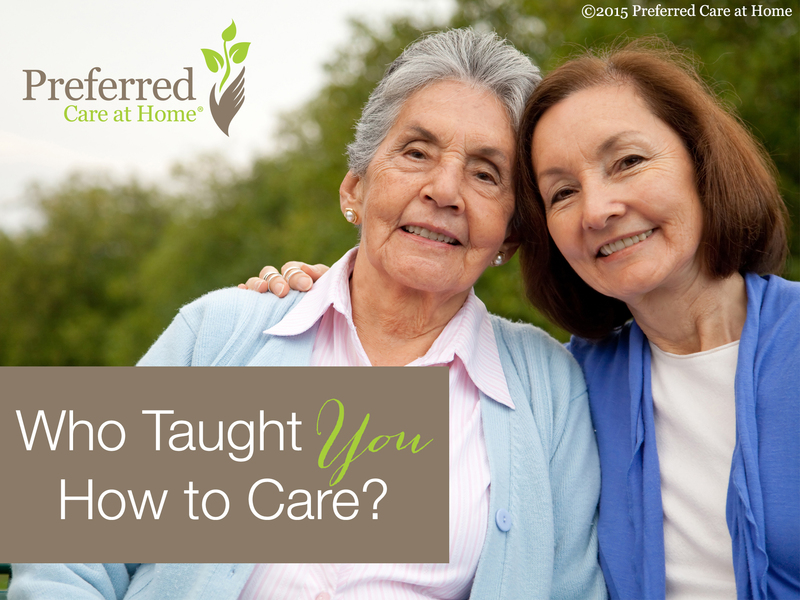 I learned how to give and to receive care by observing my mom’s interactions with family, friends, and strangers. Her actions spoke louder than any words—just like the snow-covered eagle. As my mom cared for others, she embodied my family’s legacy of care. Whether we realize it or not, families (however you choose to define family) develop attitudes about and approaches to caregiving that are passed down from one generation to another. These legacies of care may or may not serve us well. But family legacies—good and bad— tend to persist. Historical patterns of caring can be as characteristic of a family as biological and cultural traits. Because people typically resist change, it’s challenging to revise these known patterns of care. For example, I learned at a very young age that caring for others (even to the exclusion of my own needs) merited high praise. My family legacy of care was predicated on the belief that it was always better to give than to receive care. Hence, I never learned how to ask for or to receive help from family or friends. Consequently, I have a tendency to assume too much responsibility as a caregiver. And, I am quite uncomfortable as a care receiver. But the reality is that I have needed and will need assistance from personal and professional caregivers. So, I have the opportunity and the responsibility to improve the process for my family—to tweak our legacy of care. Legacies need not be etched in stone. Over time if our legacies of care are to serve us well, they must evolve along with changing family structures, health care systems, and care requirements. A legacy of care typically evolves slowly—a process predicated on the specific family context. The past obviously informs how we currently care. The present challenges historical approaches to care. As a result, the future is the beneficiary of needed modifications and renovations to family legacies of care—if we are willing to make the needed adjustments. So, honor the past. Be attentive to the moment. And ultimately, be mindful of the legacy of care passed on to others. At some point, we transition from being students to teachers of our family legacies. By word and deed, we all convey a unique image of caregiving and care receiving—just like the bald eagle covered in snow. The image of my mom will forever inform my life. However, I am not constrained by her legacy of care. Rather, I am compelled to contribute to my family legacy of care—and hopefully improve the process. So, it’s important to recognize who taught us how to care and to critically assess the lessons learned. But it’s equally important to realize who is learning from us! By embracing the role of mentor, we can help to ensure that our students soar to heights previously unimagined. On eagles wings, eh?